Sethuraman "Panch" Panchanathan of Arizona State University named National Academy of Inventors fellow. Dr. Panchanathan exemplifies the spirit of innovation, entrepreneurship and social responsibility that ASU aims to cultivate. Sethuraman “Panch” Panchanathan, senior vice president for Knowledge Enterprise Development at Arizona State University, has been named a Fellow of the National Academy of Inventors (NAI). Election to NAI Fellow status is a high professional distinction accorded to academic inventors who have demonstrated a prolific spirit of innovation in creating or facilitating outstanding inventions that have made a tangible impact on quality of life, economic development and the welfare of society. 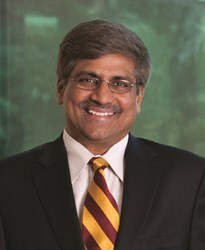 Panchanathan is a professor in ASU’s School of Computing, Informatics and Decision Systems Engineering. He is also director of the Center for Cognitive Ubiquitous Computing (CUbiC). Together, the 143 innovators elected to NAI Fellow status hold more than 5,600 U.S. patents. Included in the 2013 class are 26 presidents and senior leaders of research universities and non-profit research institutes, 69 members of the National Academies, five inductees of the National Inventors Hall of Fame, six recipients of the U.S. National Medal of Technology and Innovation, two recipients of the U.S. National Medal of Science and nine Nobel Laureates. The NAI Fellows will be inducted by Deputy U.S. Commissioner for Patents Andy Faile, from the United States Patent and Trademark Office, during the 3rd Annual Conference of the National Academy of Inventors in March.